Just as its name suggests, Retrovi (meaning ‘rediscover’ in the Esperanto language) experiments with the traditional designs of Lefkaritiko lace and Fythkiotiko weaving, introducing new applications, while always respecting craft and tradition. 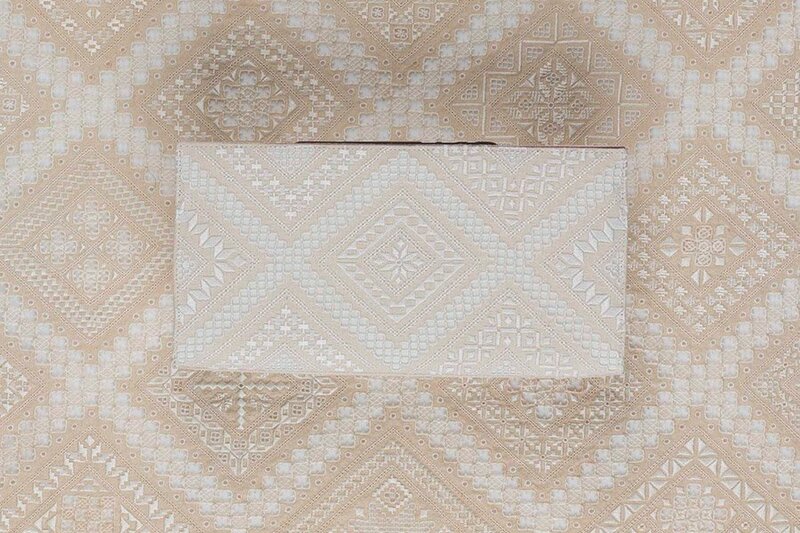 Through this innovative project, which marries Cyprus heritage with fashion, Retrovi aims to reveal the beauty and uniqueness of Cypriot tradition using the exceptional art of Lefkaritiko and Fythkiotiko to create fashionable items for women. The great importance of this embroidery as our island’s cultural heritage simply has to be displayed. For this reason, the Retrovi project ensures the continuation of this tradition, putting forward the freshest ideas with brand new applications of this exquisite craftwork. For years, Retrovi had been exploring the best way to bring together Cyprus past and Cyprus present, until the idea of the handcrafted bags was born, turning Cyprus’ prominent embroidery into contemporary fashion. All Retrovi pieces are handmade, some of them embroidered with fine needlework and some of them entirely woven on the loom. Only the best materials are used to provide the highest degree of quality, and the beauty and uniqueness of each creation could not be better represented than by royal names in Cyprus history. The renowned queens of Cyprus who gave their name to Retrovi bags, are Berengaria of Navarre, Alice of Champagne, Isabella of Ibelin, Eleonora of Aragon, Helena Palaiologina, Charlotte, and Caterina Cornaro. The summer collection featuring crochet items showcases the island’s never-ending sunny mood, and is naturally named after the queen of love and beauty, Aphrodite. Heritage can never be forgotten and the modern woman points the way on how to revive tradition and rediscover our history. Cyprus has a long tradition of embroidery and its geographical position in the south-east Mediterranean, at the crossroads of the East and the West, has always been a great influence on the island’s civilisation and art. Its significant position on the busy trading routes, along with its rich natural resources, attracted many invaders, and Cyprus came under the rule of most of the great empires of the times. These periods of occupation left behind many traces to be incorporated into local art. This tradition of lace-making dates back to at least the 14th century. Lefkaritiko embroidery has its origins in the regional white embroidery “asprobloumi” which was worked in all regions of Cyprus. Parallel to this, lefkaritiko work was influenced by Venetian lace work which was brought to Cyprus by the Venetian ladies during the Venetian rule (1489-1571). Influenced by indigenous craft, the embroidery of Venetian courtiers and ancient Greek and Byzantine geometric patterns, the Lefkara embroiders created cut work designs which they adapted according to their own ideas, tastes and skills on the material, producing original designs. 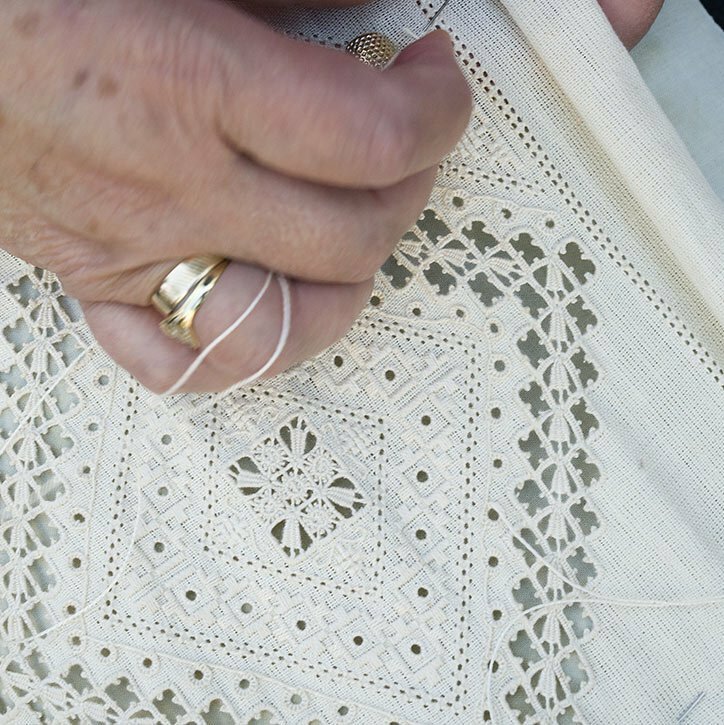 This combination of art and social practice is still the primary occupation of women in Lefkara village and, being the biggest centre of this type of embroidery, the lace was named after it. Lefkaritiko lace is handmade needlework; it is basically a cut-and-drawn type of embroidery with a rare variety of patterns and variations worked in satin stitch. Most motifs are geometric, with a few taken from plant life, such as “the daisy”, “the leaf” and the “palm tree”, but the basic motif is a zig-zag design which represents “the river”. Unique mastery of the craft is passed down from generation to generation and each talented lace-maker uses her own rich imagination to create original patterns, designing work that embodies both tradition and her own personality. Since the late 19th century, this craft became a professional occupation of both the women of Lefkara who embroider, and the men who toured the main towns in surrounding countries, travelling from Greece to near Europe, and then to Scandinavian countries and America, selling their beautiful wares and taking orders to be fulfilled by the women back home. Hence, the fame of lefkaritiko lace was spread far and wide. Lefkaritiko lace is included in the Heritage Archives of the Municipality of Lefkara and in the Archives of Oral Tradition of the Scientific Research Centre of Cyprus, as well as at the National Heritage Index being created by experts at the Cyprus Research Centre. 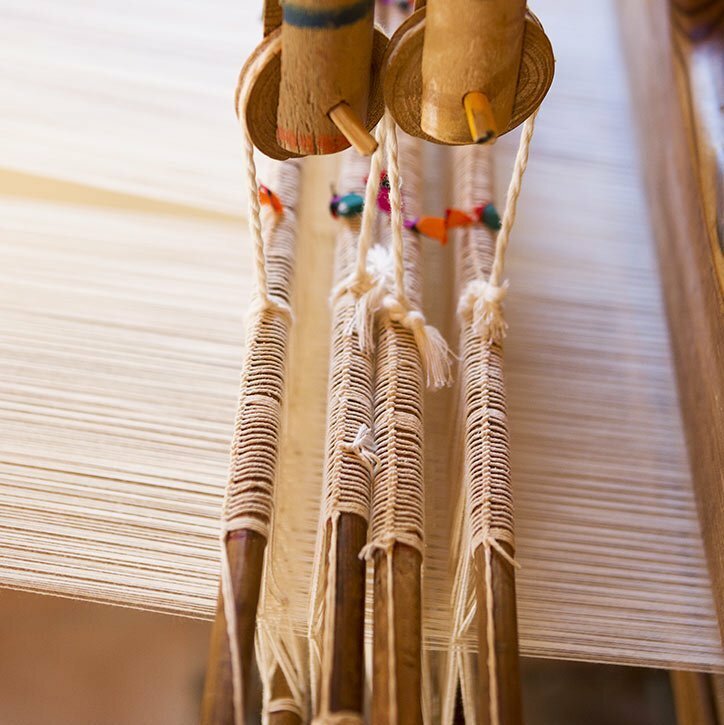 Weaving has flourished in Cyprus since ancient times while reference to the Cypriot weavers is made in historical sources as early as the 6th century B.C. Nonetheless, weaving’s golden age in Cyprus was during the Middle Ages, and more specifically, during the Lusignan period (1192-1489). 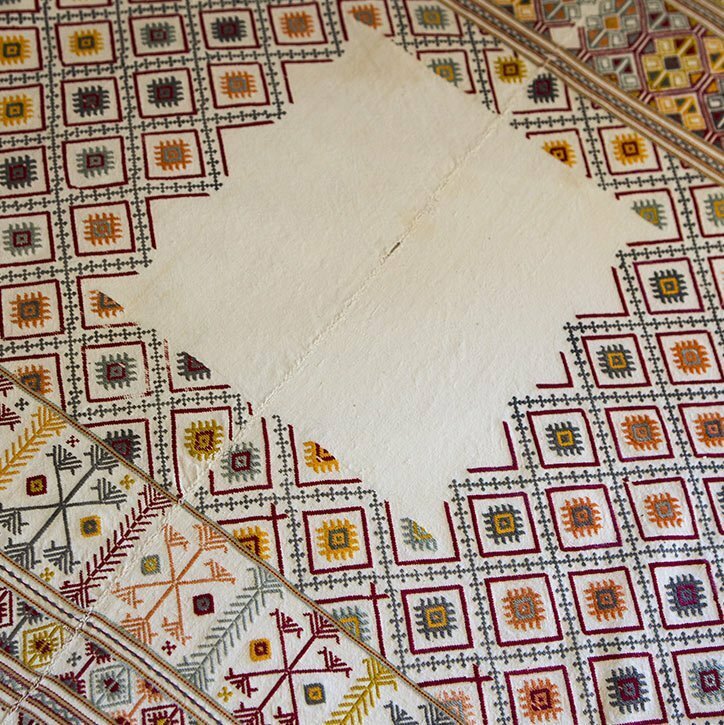 One of the reasons weaving was so greatly developed in Cyprus throughout the centuries, was the excellent quality of raw materials produced locally. 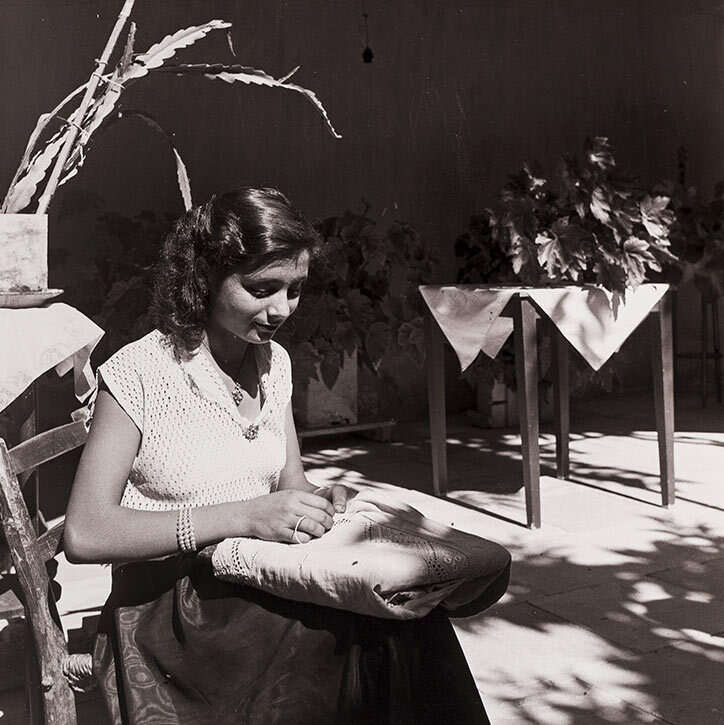 Processing cotton, spinning it and weaving it was one of the main occupations of Cypriot women. 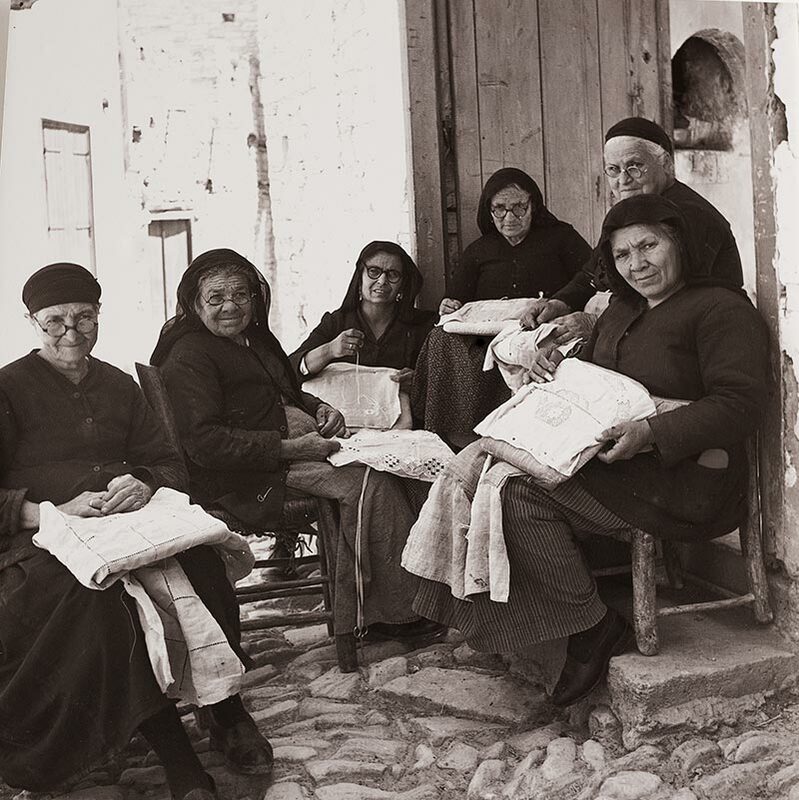 Even though the art was developed in other areas of the island as well, it was the prime specialty of women in the remote Paphos district, especially in Fyti village, and for that reason, these weavings are known as Fythkiotika. In fythkiotika works, the weaving takes place on the loom. Since ancient times, the loom was an integral element in every Cypriot household and a characteristic of the people of Cyprus is to insist on the use of traditional techniques, thus, the methods and tools used for the processing of raw materials have changed very little over the centuries. 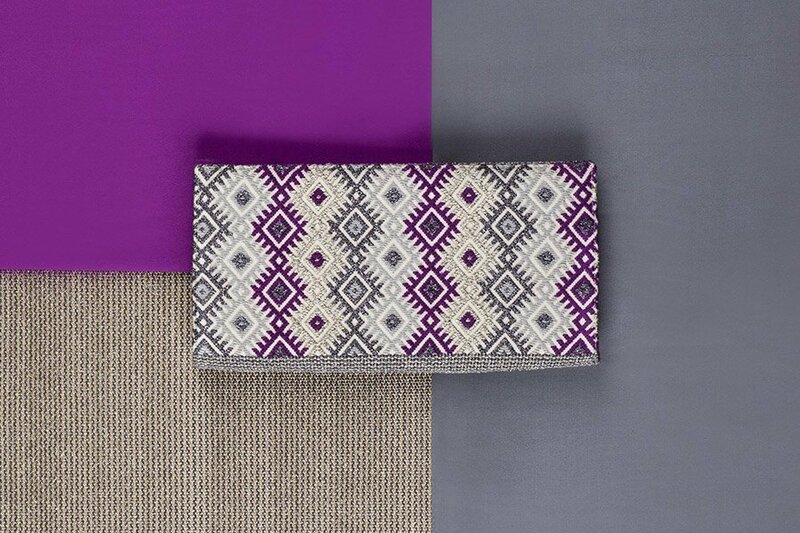 The decorative patterns used in the weaving are of multi-coloured geometric design, with the rhombus as the prevalent shape, a basic motif for fabrics woven on the loom. Another common design is the arch, whereas cross and fishbone are also prominent, albeit rarer patterns. The weavings stand out for their varied designs, usually geometrical, placed in parallel lines, most commonly at the end of the fabric, as well as their rich and colourful hues featuring blue, red, green, yellow and orange. With their special, colourful decoration, they are deemed aesthetically and artistically interesting and are very important examples of Cypriot tradition and folk art.